DHC Interiors presents: BLUE LOVE CHANDELIER. Each chandelier is made of hand-blown glass by skilled artisans making each one an individual work of art. The presence is magnificent and done in approx 80 pieces. Both smaller (Mini, 60pcs) and larger (110pc, 150 pc, or custom) sizes are available. 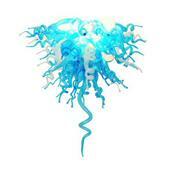 The style is reminiscent of a Dale Chihuly piece of art as seen in the Bellagio and Borgata Hotels. This can be done as shown in the first photo, multi colored, or color of your choice. Photo attached with other color combinations. Contact us for custom colors, sizes and pricing. Samples of the glass for color can be ordered. Elongated Horn is optional.